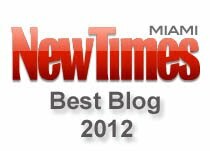 On his website, Miami Beach Mayor Philip "Just Get It Done!" Levine says "Our flood mitigation program is just in the early phase with only 10% of the program having been completed to date and we are already seeing encouraging results." But it's safe to say that Levine never envisioned at least one benefit his "flood mitigation program" would provide Beach residents. While crews got busy "mitigating" in neighborhoods where Levine has extensive real estate holdings, other areas were neglected. And that means that many folks on the Beach are now getting to know each other just a little bit better. Yesterday, veteran Miami Herald photographer Walt Michot captured these images of Miami Beach residents pitching to help neighbors and co-workers who have been affected by the flooding. on Friday, Oct. 9, 2015. 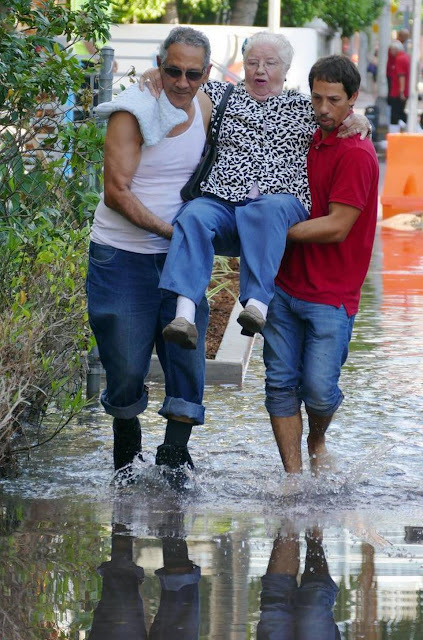 Photographs by Walt Michot/Miami Herald. 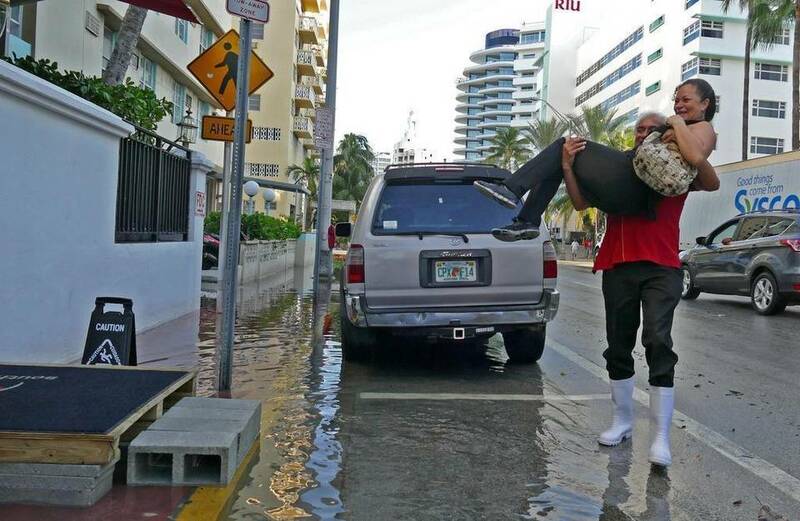 Daysi Rodriguez over floodwaters on Miami Beach on Friday, Oct. 9, 2015. Curiously, there aren't any pictures of Miami Beach firefighters helping stranded elderly citizens. That's probably because they're too busy out campaigning for Levine. 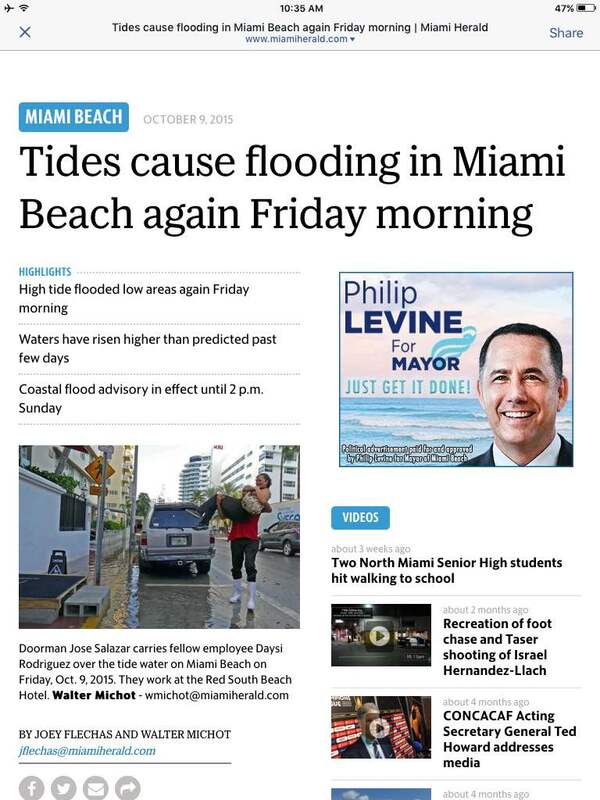 And while Mayor Levine's ad agency is feverishly churning out one ad after another in an attempt to convince Beach residents that he's got the flooding situation under control, the Herald found at least one person who's not convinced. But over at 10th Street and Alton Road — less than three miles from the Alden Hotel where Hernandez works — it's a different story. 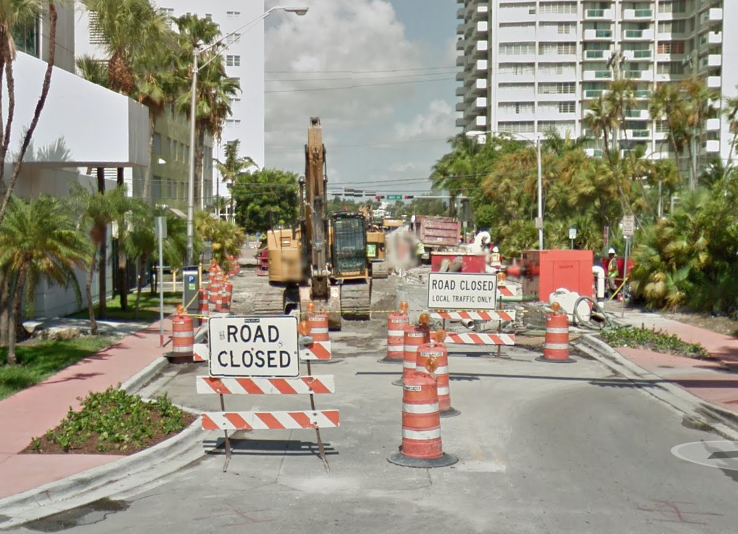 I'll let Miami Beach spokesperson Nannette Rodriguez explain: “Sunset Harbor is bone dry. You used to not be able to get into the Publix, and it’s all dry. Even Purdy Avenue is dry. 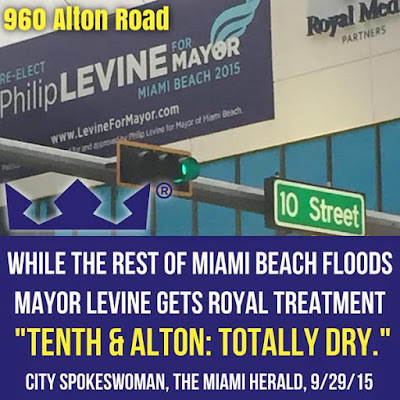 Tenth and Alton: totally dry,” Rodriguez told the Miami Herald's Joey Flechas a few days ago. So why are some locations "bone dry" while others are under feet of water? Call it happenstance, but the building that sits at Tenth and Alton is owned by Miami Beach Mayor Philip Levine. Flechas never shared that information with his readers. And the Sunset Harbor and Purdy Avenue locations also mentioned by Rodriguez? If you guessed that Levine also has real estate holdings at Purdy and Sunset Harbor, you guessed correctly. Flechas also neglected to include that bit of equally important information in his story. 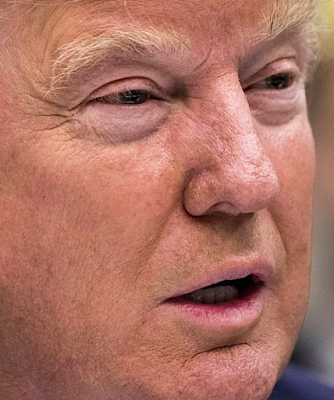 The video below speaks volumes. It isn't as slick as Levine's campaign ads, but the pictures say it all. 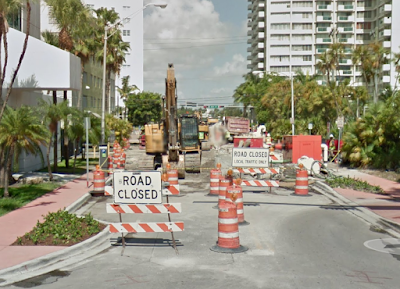 10th Street and Alton Road, Miami Beach. Images via Google Street View, July 2015.